The sun is shining and it is beautiful outside. The trees are budding and everyone is headed outside to enjoy this emerging season of spring. Last year I moved the landscaping boundaries and today I discovered that STILL the bulbs forced their way to the sun....In the middle of my grass. Messing up my OCD! It is rather interesting. 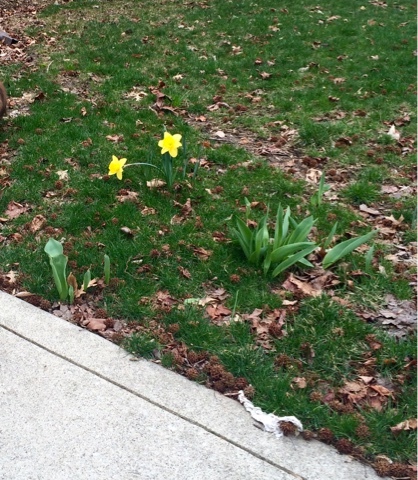 Underneath the perfection of my newly planted and manicure grass, I have daffodils and tulips emerging. This was not part of my plan! Today- I am inside of my little cottage....Grumpy and frustrated. I cannot breathe well-- thanks to my significant asthma and a recent respiratory infection. The entire world is happy and the sun is shining -- and i am sad and grumpy. I try very hard to be extremely positive, but all of the happy feelings around me-- quote honestly-- kinda pisses me off. For grievers, this is a common feeling. Soon spring will emerge and we will begin to see new life all around us. People leave their homes to venture outside. Birds twitter everywhere. Baby squirrels will fill my backyard. I have always enjoyed spring.... Well, almost always. After the death of my son, I found that the changes of the seasons could often be challenging. That sounds so odd, doesn't it? EVERYONE, it seems, is happy during springtime. I firmly believe that "time" does not make grief better. Instead, I believe that it is what you "do" with that time that creates a forward moving path towards healing. You must do your grief work. Recently I had the opportunity to speak to a national convention of pulmonologists who are involved in legislative and regulatory respiratory decisions. I was very very sick at the time with my own asthma issues and was only able to make these presentations because of the high doses of prednisone. Do I feel satisfaction? Eh- I suppose. As a recovery room nurse, I find satisfaction in knowing that patients will eventually have a better safety net because of the newly emerging changes in the future of respiratory monitoring. At the end of the day, my child Logan, is still dead. My entire family was destroyed. Nothing will ever be the same. The "same"-- was it perfect or even good? Not really. It is easy to look backwards and "see perfection" when in fact our lives were really not in a good or healthy place. Usually, I have "let it go." Today my personal situation still feels a smidgen of sorrow as I look backwards at my life. I am extremely thankful that our loving God has allowed me the opportunity to create a new and more positive and healthier beginning-- but today I am still grumpy. This weekend I have found a commonality with several other grievers that grumpiness is a theme. One final note-- my Logan would be so very proud of ME, his mommy, for pushing forward -- after the horrific devastation of losing a child. Logan really really loved me and demonstrated it often. Know and believe that it IS possible to have joy again. Hang in there friends. Be patient with yourselves.... As I am patient with myself. I know I will feel better when I can eventually breathe better. I really need to push through this asthma exacerbation as well. All of my posts are written to demonstrate transparency- this one included. There are so many silent grievers out there. Kindness is free. Sprinkle it everywhere. Constantly. Eliminate the mean and negative people from your life, and strive to grieve forward- regardless of how you feel. Hugs.... It does get better.